Got a spreadsheet, full of values/text content and you want to search for a specific word in a row or column then excel with its Find utility(CTRL+F) will let you strike through the search word from the selected position of excel sheet in no matter of time one by one until the last matching search term is found. But if you want to highlight the search word to filter out the field containing the search term then unlike other tools it doesn't highlight all the search term containing fields by default. For instance: A column with n rows of data like Home Addresses and you want to filter out address fields containing the street name as New Jersey. How to Highlight MS Excel Search Results In Color? Just follow the below steps to emphasize the search term containing fields in colors of your choice from the color palette. 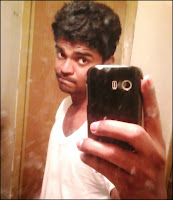 Open the excel sheet containing the data. 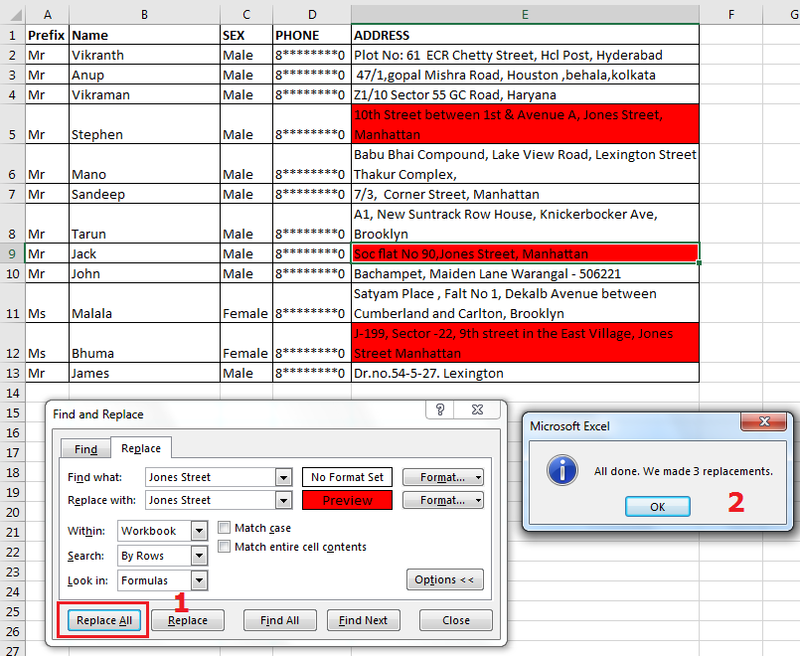 Press Ctrl+A to select for search through the whole excel sheet (or) select the range of row/column from the excel sheet. Eg: Column A from Row 1 to 100. Press Ctrl + H to open find & replace Window and enter the search term For example "Jones Street". Now click Options >> on the find and replace window to open additional options underneath the same. Then in Replace with row Enter the same search term as entered in Find what field and then click on Format option to open a new window for formatting. 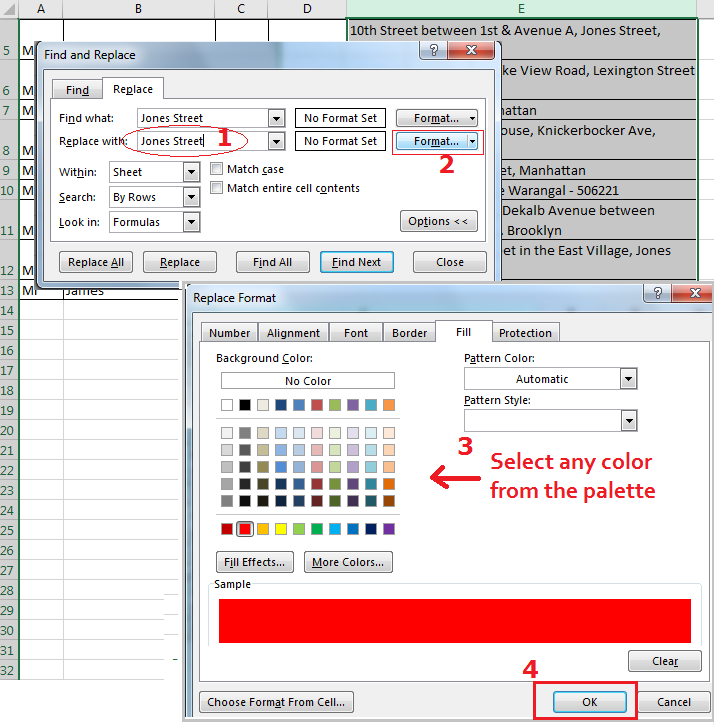 In Replace Format window ->Tap to Fill tab and then select any color from the color palette and click on Ok to confirm. Now in Find and Replace window click on Replace All to highlight the search term containing fields with the opted color. 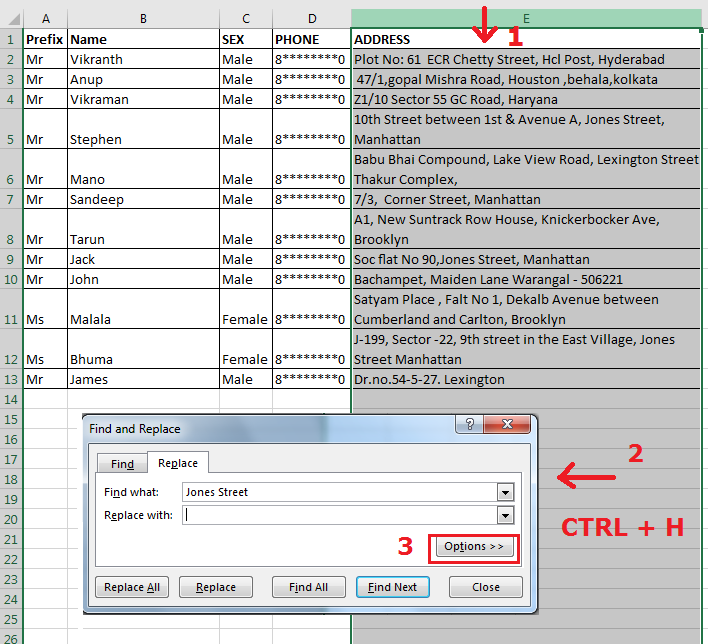 Now all the cells containing the search term will be highlighted with the selected color on the excel sheet. After this, if you want to filter out the search cells separately, press CTRL + Shift + L keys (or) Under the main menu Click on Data ->Filter then Filter by Color. Nice answers in return of this question with solid arguments and explaining all on the topic of that.